From Goodreads ~ Mark Rosenberg has had more ups and downs with his weight than Oprah, but unlike Oprah, no one gives a sh*t. Coming of age very outrageously as an overweight, soon-to-be gay kid, he learns to relate to others by way of his beloved "Melrose Place" and "Clueless", which serves him well when exiled to fat camp and faced with an opportunity to bribe an adulterous counselor or poison his stepmother by birthday cake - and thinks nothing of dressing as Homey the Clown (in blackface) for Halloween. This sets him up for adulthood in the image-obsessed world of gay men in New York City, where he hires personal trainers he wants to sleep with, applies an X-rated twist to "Julie & Julia" in an attempt to reach blogger stardom, and has an imaginary relationship with the man on the P90X workout infomercials that becomes a little bit too real. 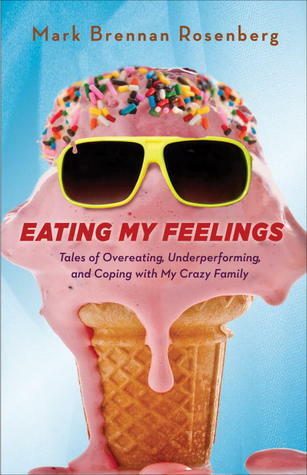 Hilarious, heartwarming (as if) and especially scandalous, Eating My Feelings leaves no stone unturned and no piece of red velvet cake uneaten. I'd never heard of Mark Brennan Rosenberg so didn't know what to expect ... I've since discovered that this is his second book and he blogs at the Huffington Post. The title of this book had caught my eye ... and I'm glad it did because I really enjoyed it! Mark is the son of a Jewish dad and a Christian mom (his dad has been married four times and Mark's mom was his second wife). Mark was an overweight gay kid who liked nothing better than to sit on the couch, pig out and watch soap operas. Choose Your Religion - As an enticement to embrace his Jewish roots, his dad and evil stepmother try to bribe Mark with a party (bar mitzvah) and vacation. It works with his brother, Kevin, but not Mark once he realizes how much work it will be (he has to learn Hebrew). Heavyweights - His dad and evil stepmother send Mark to a "basketball" camp (it was really a fat camp) one summer so he'd lose weight rather than the theatre camp he wanted to go to. The Fifty Dollar Diet - His dad and evil stepmother bribe Mark to lose weight by promising him $50 for every ten pounds he loses. All Shook Up and the Flyer Boy Follies - His experiences handing out flyers for half-price theatre tickets. Tuesdays with Ricky - Mark hires a personal trainer, Ricky. The P90X-Files - Mark's experience with this intense workout program. I thought this book was really hilarious. I liked the writing style ... Mark is very sarcastic and funny. I bet he would be a hoot to hang out with. The language and activity are quite explicit and for mature readers ... words that rhyme with "hunt", "duck", "mothertrucker", etc. are used quite often. I would recommend this book and look forward to reading more by this author. I definitely need to read this one. I can totally relate. I'm glad this isn't my car!